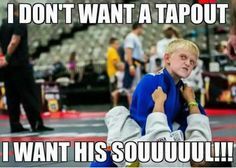 One of the things I remember from my first round of jiujitsu training, and even my second revival is ego. When you first start training, you don’t want to lose. You want to come in and dominate people, show them how tough and strong you are. This is human nature, and if you don’t learn it on your own, your teammates will soon teach you humility. At my first school, one of the slogans was, “leave your ego” at the door. That is so true, it’s super important to check your ego at the door in order to be able to absorb and learn what is being taught. Also, understand that no matter how tough you are, you are going to lose. Everyone is going to lose! That’s just the nature of this work. So as more experienced white belts, it’s on us to deliver this message to the new students. Of course the higher belts will do it as well, but if you roll with a new person, as a white belt who’s been around for a while, you can set the tone and expectations of what will be happening here. You don’t want to dominate the new guy, nor discourage them. You want to foster a feeling of being welcomed, learning, and an opportunity to grow. If they are overzealous, perhaps you can dial it up a bit to simply show them that it can be done, but never lose control. Recently, I rolled with a brand new guy, and I took it easy in regards to submissions. I didn’t try to submit or tap him out. I simply let him feel my body. I worked moving around the few positions that I know. I allowed him to sweep me and wind up in my guard, and then tried to direct him on how to proceed from there. I also coached him on what I was doing or trying to do to him so he can start learning what to feel for. All this was being done while I was applying pressure and making him work hard simply to breathe and not feel smothered. He told me that he was grateful for the roll and that it was really helpful to him as he was just starting and had no clue how to work on the ground. On the other hand, I’ve rolled with really strong and tough guys who were just starting and they came in like we were at a UFC fight. Guys like that, you have to slow them down. I remember this one dude, he was naturally very strong and agile. It was really hard to control this guy because he was so damn strong. But I eventually caught him in an arm triangle and choked him there. But it was not easy. This guy was trying really hard to dominate me and came in with a take no prisoners attitude. When that happens, then you have no choice but to rise to the occasion and bring the same level of heat to the sparring session. I’m not sure whatever became of that guy, but I’m sure if he continued he became a really good BJJ guy, his power, instincts and agility were no joke. Generally, people want to learn and come in with that mindset. Don’t take that away from them by crushing them the first few sessions. However, if you encounter that guy who wants to take your soul, then return in kind. Also, watch out for those guys with the wrestling background, they can be very dangerous on the mats.